To provide an easy way to visualize and navigate the relationship paths and information in graph datasets, you use property graphs. Developers can use the Neo4j Browser to visualize graphs, run ad hoc queries and view their results. But to execute powerful queries and to build complex graph applications, you need graph APIs or a graph query language such as Cypher. 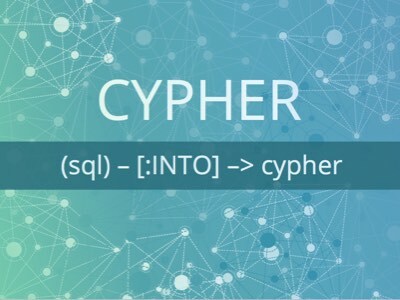 Developed by Neo4j, Cypher is the leading query language of graph databases. You use it to easily and efficiently access and manipulate graph data, making simple things easy and complex tasks possible. What Does a Cypher Query Look Like? Cypher combines prose and symbols (iconography) to make queries more visual and self-explanatory. It’s the closest thing to drawing on a whiteboard with a keyboard. Property graphs are whiteboard friendly; Cypher makes them keyboard friendly and easy to learn for developers, architects and operations professionals. When you write Cypher queries, you ask Neo4j to find data that matches specific patterns. Think of a Cypher query as a request to “find things like this” in your graph database. If you have written SQL queries with a large number of joins, you know how quickly you lose track of what the query actually does. And if you are asked to maintain someone else’s complex SQL code, you know how frustrating that can be. In sharp contrast, Cypher code is easy to follow and focuses on graph elements and relationships rather than indexes and complex join syntax. Cypher is a declarative language that enables you to specify which data you want rather than the mechanics of how to retrieve it. Neo4j takes care of the rest. In contrast, early-generation graph languages required you to thoroughly understand how your data is stored. Cypher eliminates this burden and frees you to focus on your business problem rather than technical implementation details. The openCypher Project is an open-source software project started by Neo4j to establish Cypher as the standard query language for graph database management. The openCypher project transforms Cypher into a standard language that any database, tool or application vendor can use as a mechanism to query and manage graph data. For more information on the openCypher project, visit www.opencypher.org. What Are the Benefits of openCypher? Want to Learn More About Cypher? Insert URLs of relevant Cypher postings and open them in new browser tabs or windows.